Firestorm in the new Justice League? On Bleeding Cool yesterday, an image by Jim Lee was released featuring the new Justice League. 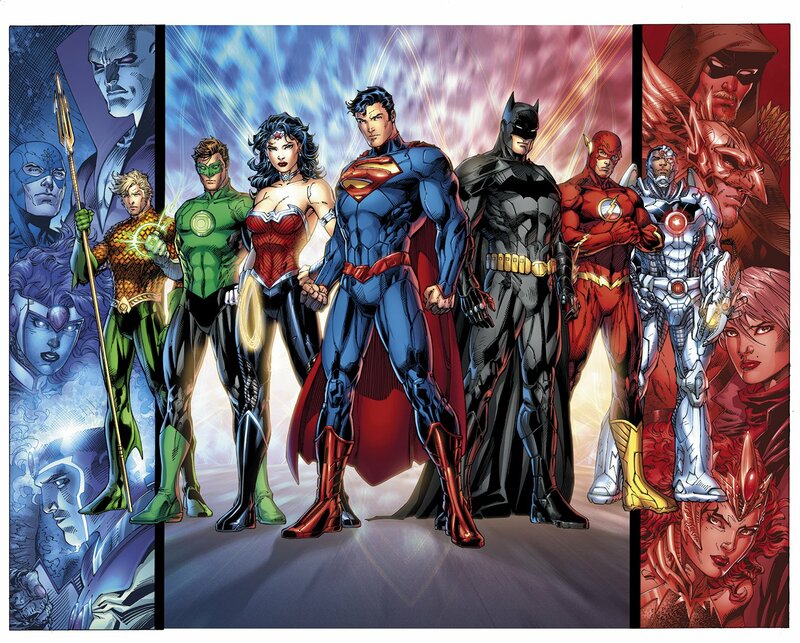 The team consists of Aquaman, Green Lantern (Hal Jordan), Wonder Woman, Superman, Batman, Flash (presumably Barry Allen), and Cyborg. Interestingly, in the background you can see Deadman, the Atom, Elemental Woman (presumably), Green Arrow, Hawkman, Power Girl (presumably), Mera and… FIRESTORM! Yes, Firestorm is featured in the new Justice League promotional image. Hot dog! Click the image above to enlarge. High resolution image via The Aquaman Shrine. This matches up with something Geoff Johns said on Twitter back on June 21. Our good buddy Brandon Leonard wrote on Twitter to Geoff, “Hope firestorm is part of the new Justice League he deserves his spot back!” Geoff responded with, “We will eventually have a large team like Justice League Unlimited in a way so we’ll see!” The combination of Geoff’s quote on Twitter, combined with Firestorm appearing in the background of this image, suggests that Firestorm will be on the team eventually, but not right away. Now we gotta wonder which Firestorm is this? Is this Ronnie, Jason, or “Super-Storm”? To me, this looks more like Jason because there are no black bursts around the eyes and the headpiece isn’t pointed on the cheeks. However, that might just be artistic interpretation. Regardless, exciting news! My thanks to the legion of match-heads that send this news my way: Brandon Leonard, C.T. from Nerd Lunch, Frank Lee Delano, and Keith Baker! Posted in: Firestorm #09: New 52 v1 (Firestorm Protocols), Geoff Johns, Justice League of America. According to Geoff Johns, that isn’t Power Girl or Black Canary on the right. She’s not even supposed to be blond. I agree with you that the face does not resemble the Ronnie-storm. however at the same time he looks Caucasian maybe its the fact that its on a blue backdrop but it doesn’t look like Jason. I had a theory that the anti monitor firestorm was an accident or an uncontrolled firestorm. so maybe this is what he will look like when Ronnie and Jason get the matrix under control? Ahhh Yeah! Firestorm is back where he belongs, front and center in the DCnU. This takes me back to the satellite era of the league, with the big 7 anchoring the Justice League supported by a cast of another dozen or so lesser known heroes who come off the bench to play a role in the team dynamic. I don’t know which version of Firestorm we will get but I am glad he’s back in the lineup. Johns has said that the first story arc (presumably six issues) of Justice League will take place in the past (presumably five years) and chronicle the “secret origin” of this Justice League. I imagine he’s referring to the new Core 7, so, yeah, probably won’t see Firestorm on the League until March 2012 at the earliest.